I’ve hardly ever done tutorials for my graphic design work, perhaps with the exception of one post which talks about my digital doodlenote workflow. I remember following and reading Alia Nadhirah‘s blog entries though — she is a talented medical-illustrator-to-be — and greatly enjoying her reflections and analysis on her own designs. 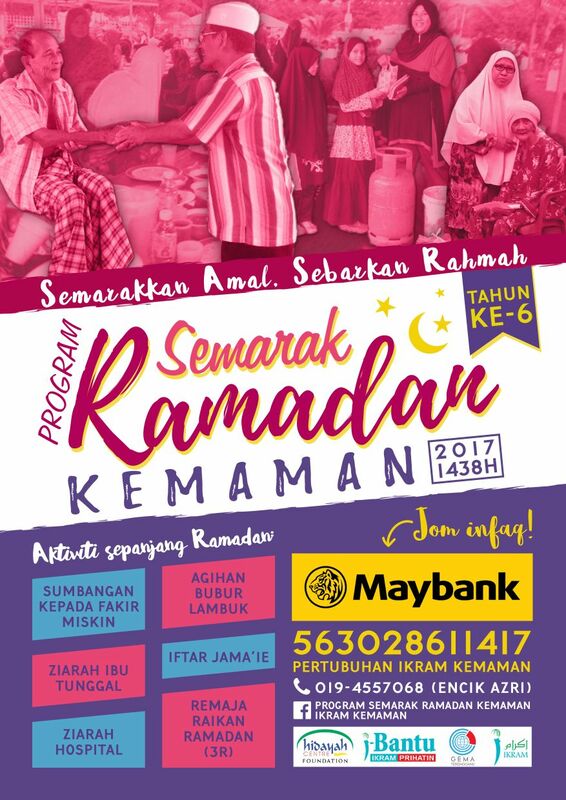 I thought I might try sharing this one recent design produced for a local NGO (I’m a volunteer) and hopefully someone can benefit from peeking into my self-taught process. Disclaimer: I don’t believe my design works are “all that”, I haven’t done that much professional work and I admit I haven’t kept up with the latest styles and techniques. That said, certain elements of design are very much like a science: often you can tell what looks good and functions well, how and why, and vice-versa. And there are ways to help achieve a successful design through specific processes and considerations. This is what I hope to show, inshaAllah. The bulk of this was done in Adobe Illustrator CS6, with a teeny bit of help from Photoshop CS6. I started off with an existing Illustrator file which had the campaign logo and social media template from last year — this was actually my own work and I kept all sorts of junk (text for font tests, reference images) around the Artboards. I saved this as a new file and started dragging the above five items into the same workspace, arranging them around a blank Artboard. This way, you are not really working on a blank canvas because there are already a ton of things staring back at you that you can work with. Now, I often find myself skipping this step only to backtrack afterwards and do it anyways. One: this is a super helpful shortcut. Two: you may find that although you have all the physical elements needed for your design to work, it … doesn’t. It might be due to lack of a concept, so you spend hours experimenting with making one up and not liking what you end up with. Swatches to choose from. I didn’t end up using all the colours, and that’s fine! What did I do for inspiration for this poster? First, I went to Canva. It is a free online design tool catered towards non-designers, but as a designer I too find it useful to steal layouts, colour schemes, typography styles, etc. 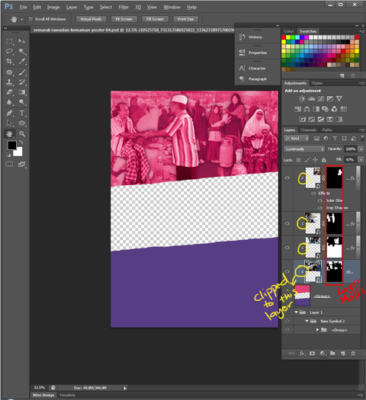 #noshame I simply browsed through the Poster Layouts and screenshot-ed a few potentials, then dragged the images and arranged them into my Illustrator file like the other references. Next, I thought I needed a fixed colour scheme so I googled “Ramadan colour scheme” or something silly like that and found this artsy photo series. I used an online tool to extract a colour scheme out of the first photo and it and saved these as Swatches in Illustrator. You may well find that this saves you time in the long run — no need to skip along the colour wheel to find colours! Based on one of the Canva layouts (the orange one with the heading “Surprise!”,) and probably the Kuantan version poster), I decided on having the campaign logo (no changes from last year) smack in the vertical middle of the poster, with a photo montage above and details below. I also adopted the “tilted” concept whereby some of the elements are not horizontal to the page. 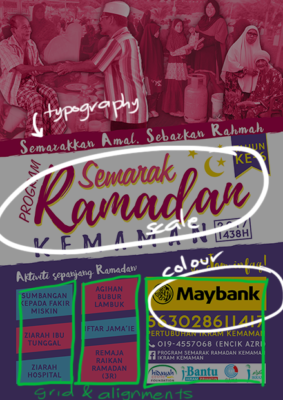 I find that this helps to add some visual dynamism and reduce the formality of the poster. I knew I had to switch to Photoshop for the photo montage. It is human nature to be attracted to faces. Instant emotion. Photos look good in print. Maybe it’s something to do with the variety in tone and details. This poster will have a banner version that will be printed big, so all the more need to utilise photos in the design. 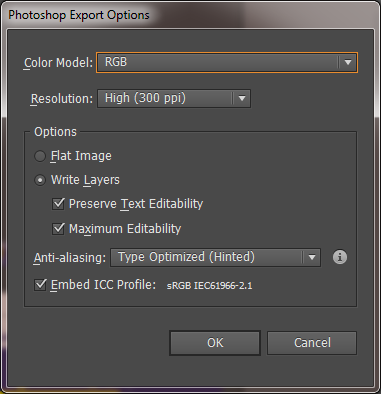 To transfer the layout I had so far into Photoshop, I went to File > Export and chose PSD. I ensured the Write Layers option was checked. 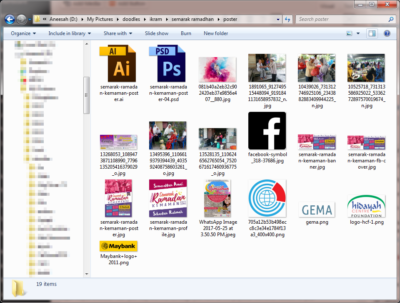 Drag all the photos into the poster document. 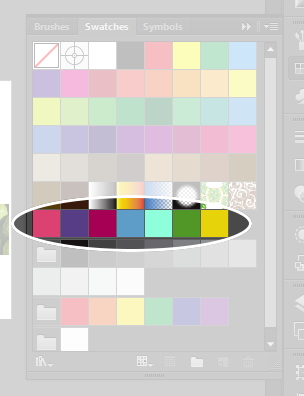 Photoshop automatically makes them Smart Objects so you don’t lose pixel data every time you resize the layers. Start with the best photo (ie. big, in focus, the one you know you must use). Use magnetic lasso tool and regular lasso tool to mask the background off. Layer Masks are your best friends forever. 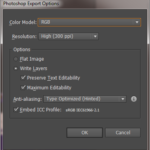 Set Layer Mode to Luminosity. This makes the photo take on the pink tones of the background. Repeat with another 2-3 photos and Clip to the layer with the pink shape. I ended up choosing one photo of a table setting during iftar as the “background” and arranging the other photos of people around it. Edit the Layer Masks again according to your arrangement, so that none of the images actually overlap. 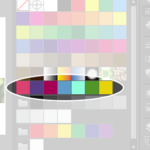 A good knowledge of selecting layer / layer mask boundaries and locking/unlocking layer masks to the layers would be really helpful. I played around with Layer Styles and ended up giving the people-photos a Drop Shadow and Outer Glow, both set to Luminosity. I also adjusted the Fill of all the layers — none of them are at 100%, with the background being most translucent at only 43%. End of Photoshop work. Take note of the Layer Masks that work to hide backgrounds of the people shots, and parts of layers that are overlapping. The photos are all clipped to the layer with the pink shape which ensures none of the photos appear beyond the boundary of the pink area. In Illustrator, I dragged and dropped the PSD file with the photo montage. Scale. Big things attract attention. You can’t miss the campaign title! Also, make sure everything is readable without needing to zoom in (this is especially for web images). Colour. To me, fewer colours are better (might be my Architecture background — I was berated by a tutor for using too much colour in my layouts). Contrast attracts attention. The yellow Maybank area attracts great attention because hardly anything else on the page is yellow. The photo montage, though big in size, has low contrast within it so it doesn’t distract from the title and footer. Alignments. I admit I’m on the OCD side for this and like to adjust text size and tracking to fit just perfectly, eg. the account and contact details. Typography. I’m not the best at this — but fewer fonts are better, and keep most “content text” simple and readable. 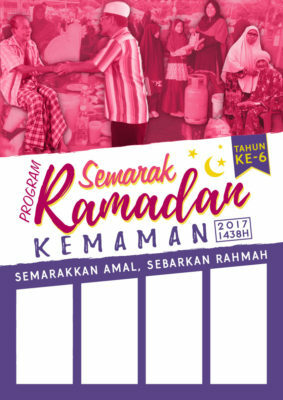 In this example I also ended up changing the font of the slogan “Semarakkan Amal, Sebarkan Rahmah” into a softer, more festive brush font rather than the same Sans Serif font of the content. Step 6: Review, feedback and edit! For this poster the only change requested was to have an additional organiser logo, so I was quite lucky! At times when working with “clients” you must be willing to compromise and edit as much as is needed in order to fulfil the brief. You’re not an artist but a designer, and to me design needs to function first and foremost. 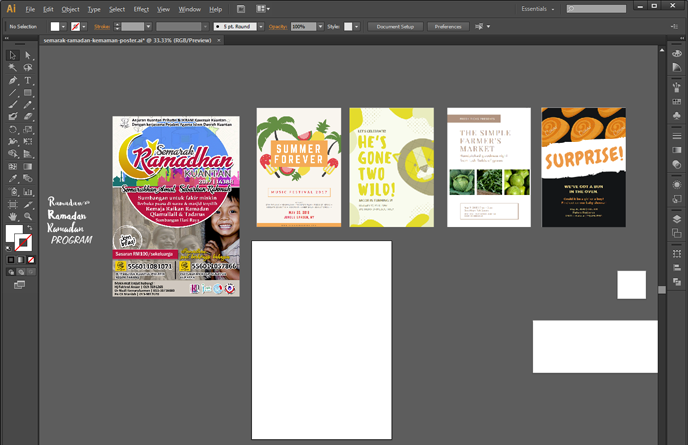 Creating the banner version was made simple by the power of Adobe Illustrator and vector graphics — I created another Artboard in the same document, copied the elements from the poster and simply resized and adjusted accordingly. Alhamdulillah, I was quite happy with how the process and result turned out. This all took one day’s work (I didn’t track the hours though). At some point it did cross my mind how renyah (meticulous?) this kind of task is: it definitely takes time and manual labour — especially the part on editing photos and arranging text in a way that functions well but looks good too. But designing is such a rewarding hobby for me, and certainly this is important: to enjoy the work and build sincerity in every effort! Hope this was fun to read. Happy to hear from you if you have any questions. 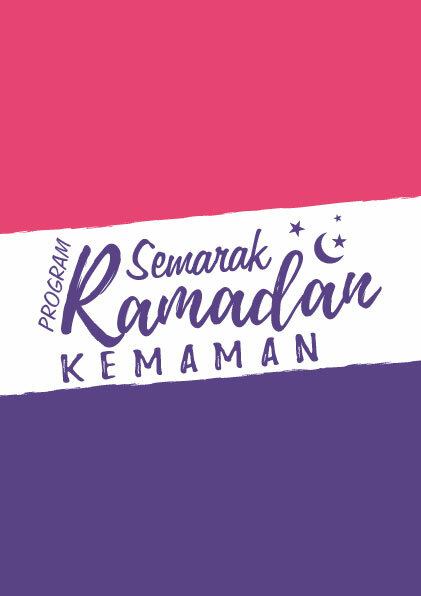 Thanks and Ramadan Mubarak!